Black-capped Chickadee are Cavity Nesting birds found in the northern half of the United States. They are resident birds found year round in their range. They do NOT migrate. The chickadees you see in winter are likely the same chickadees that may nest in your neighborhood. They often select nest sites in dead trees or branches with rotting wood. They can excavate their own cavities but will also use existing cavities like that of a downy woodpecker's or a Nest Box. They eat seeds and animal matter in the winter but when they are nesting they eat insects almost exclusively. It is important to grow native trees and plants that attract our native butterflies and moths. These butterflies and moths lay eggs which hatch into caterpillars. The resulting caterpillars are found and fed to the nestling chickadees by their parents. In the winter time you can entice them to your yard with black oil sunflowers or suet. I place peanuts out for all the birds either on a table or a platform feeder. I also supply black walnut pieces in a hanging dish feeder. It's best to serve very small pieces of peanuts or other nut meats as they have trouble breaking them into pieces that they can eat. I sometimes put a handful of peanuts in the blender to chop them into finer pieces. You can also crush them with an object like a cup. I crush the peanuts outdoors on my wooden table. Any pieces that fall on the ground will be eaten by birds. 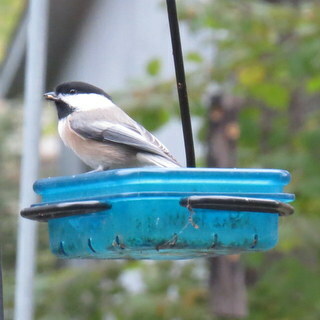 Chickadees love black oil sunflower seeds. It is the one seed that will always bring chickadees to a feeder. Black oil sunflowers really are one of the best seeds for the most kinds of birds. I feed black oil sunflower seeds in a tube feeder, hopper feeder, and a hanging platform feeder. Chickadees will come to all three types of feeders. Meal worms are another food that are relished by Chickadees. I serve them in a dish feeder. You can get live ones or dried ones. I usually serve the dried ones as they are readily available and can be stored at room temperature. They are also more affordable than live meal worms. Another great attractant for chickadees is a hanging water dish. I have ant moats that hold water that they love to drink from. Ant moats are used to keep ants from getting to hummingbird feeders, but I use them year round to water the birds. Chickadees seem to prefer to drink high above ground level. I've never seen them drink at ground level. Putting up a nest box for black-capped chickadees may entice them to nest in the box as they are cavity nesting birds. Base: 3 1/2" x 4"
I'd suggest placing more than one nest box as any extra nest boxes can be used by House Wrens or other Black-capped Chickadees. Once your nest boxes are built, you need to mount them. The method used for Nest Box Mounting is as important as the nest box itself. Black-capped Chickadees prefer a nest box that is mounting at least 5' high in an open area near trees. The method of mounting the nest box is as important as the design of the nest box. Mounting to a tree or wood post is not a good idea, as predators will be given easy access to the box. Furthermore a nest box mounted on a tree is difficult and dangerous to monitor. A much better technique is to mount the box on a 5' metal pole or a 10' telescoping metal pole. Mounting Nest Boxes gives detailed methods for mounting nest boxes. Both species will destroy the nests and nestlings of black-capped chickadees. But due to chickadees small size, the size of the entrance to the nest box can be made small enough to prevent House Sparrows and European Starlings from entering. The European Starling and the House Sparrow can be prevented from entering nest boxes by using a 1 1/8" diameter entrance hole. If a 1 1/2" hole is used, house sparrows will enter and drive the chickadees away. A 1 3/4" hole will allow European starlings to enter. You may choose to control House Sparrows and European Starlings to benefit any cavity nesting native birds as they compete for both natural cavities as well as man-made ones. House Wrens are stiff competitors for black-capped chickadees. They can fit through a 1 1/8" hole, so the hole size doesn't prevent them from entering. 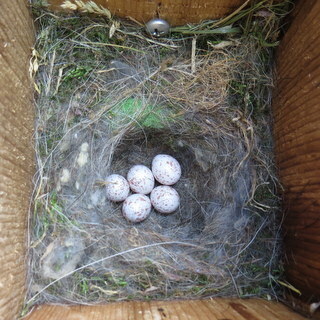 The males also build dummy nests in other nest boxes preventing other birds from nesting. Furthermore House Wrens will puncture the eggs of other birds and occasionally kill their nestlings. They are a native species which is protected in North America. The birds as well as their nests with eggs/young cannot be disturbed. There are things you can do to discourage them from competing with other cavity nesting birds. In my opinion, the best method for dealing with them is to supply 2 or 3 nest boxes for them and the chickadees. Once the house wrens have built a nest and have eggs, they seem to leave the chickadees alone. You can also remove dummy House Wren nests from boxes. The dummy nests are all twigs with no grass cup. An active house wren nest will have a grass cup where the eggs are laid. Removing the dummy nests will allow other birds to nest in the box that was previously filled with twigs. Putting up too many nest boxes in an area may encourage more house wrens. I'd been hoping for chickadees to nest in my yard since I put up multiple nest boxes in 2012. All of my small (3 1/2" x 4" base) nest boxes had 1 1/2" entrance holes. This allowed chickadees to enter but it also allowed other competing birds to enter such as House Sparrows. In 2017 I decided to put hole reducers on some of these nest boxes as I believed the chickadees were being chased away by House Sparrows and possibly other cavity nesting birds. Finally in 2017, a pair of chickadees nested in my yard. Before this nesting attempt I did see them excavating a nest box that I filled half full of wood chips. The pair selected an old bluebird nest box that I had placed a 1-1/8" hole reducer on. The box is mounted on 1/2" metal conduit located right on my patio. I feared that my activity on the patio would keep them from nesting but they weren't bothered by my presence at all. May 10: A chickadee is seen bringing nesting material to the nest while its mate watches over her. Watch a video of them building the nest. May 12: The nest looks complete and is composed of a layer of moss for the base, followed by grass, and topped off with animal fur. The pair has its first egg. May 16: The nest contains 5 eggs. June 2: The eggs have hatched and two of the chicks look larger than the others. 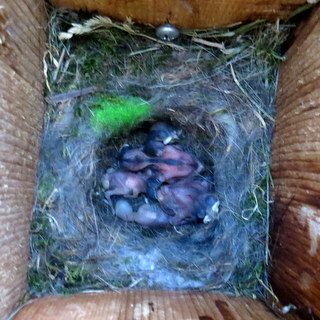 June 5: I don't see the chickadees at the box. I open the box to find the chicks all dead. One of them looked like it was pecked. The House Wrens must have killed the chicks. I'm perplexed as to why this occurred this late in the nesting attempt. Upon further investigation, I decide to check on the House Wren's nestbox. In it, I discover all of their chicks are dead. It appeared that a mite infestation killed their chicks. Once that happened, I suspect the wrens destroyed the chickadee nest. I believe the wrens were busy caring for their nest so they left the chickadees alone.